Farnham’s music lovers had the opportunity to enjoy this group’s music-making at the Parish Church in Farnham on 31 October. 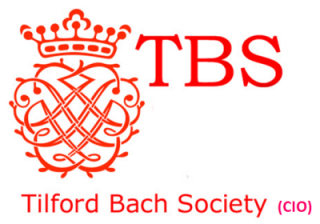 The concert was dedicated to the memory of Sir David Willcocks CBE MC, a late president of the TBS who died on 17 September.There is an extensive obituary in the Daily Telegraph – HERE and in the Independent HERE. The concert was sponsored by Lord Lea of Crondall, who gave the following personal tribute. “I played the double bass in the Cambridge University MS Orchestra circa 1958- 61 and he was not only inspiring musically – I remember as if it was yesterday our rehearsals and performance of Verdi’s Requiem in Kings College Chapel – but was also so kind and generous – in for example writing in his own hand to say that he totally understood and agreed when I asked for permission to miss a rehearsal when it clashed with a debate I was involved in at the Cambridge Union. Fast forward and only in the past five years I was singing in a choir which he conducted in Leipzig – in the Maria Kirche – the domain of JS Bach and ditto for Handel in Halle not too far away. An attractive programme started with Beethoven’s quartet no.10 in E flat major “The Harp” which starts slowly and quietly but then moves to an allegro that includes some pizzicato, an unprecedented feature for a string quartet. This gave rise to the name “Harp” for the work. The piece was beautifully delivered and greatly appreciated. The second piece was the Shostakovich quartet no. 8 composed to reflect the victims of fascism and war, with the menacing background threats of Stalin who had started denouncing un-Russian music. There is a theme based on the key letters of the composers name woven into the music as his desire to have at least one piece dedicated to himself. The final work was Schubert’s “Rosamunde” quartet, containing a familiar theme taken from an entr’acte Schubert had written the previous year for the play of that name. This short lived but most musical of composers, who was bursting with wonderful tunes, is a joy to hear at all times and this performance was a beautiful experience that sent the audience home very impressed and with a lovely musical event to remember. Winners of the 2014 Royal Overseas League Ensemble Competition, the Solem Quartet were brought together in 2011 by their studies at the University of Manchester, where they take their name from the University motto “arduus ad solem” meaning “striving towards the sun”. Having moved on to study at the Royal Northern College of Music, the quartet enjoyed success in numerous competitions including the RNCM Nossek Prize, the RNCM Barbirolli Prize for String Quartets and the Britten Centenary Intercollegiate String Quartet Competition. Continuing their relationship with the RNCM, the quartet have recently been awarded the Junior Fellowship in Chamber Music 2015/16. The Solem Quartet enjoy an increasingly busy concert schedule performing at venues across the UK including Wigmore Hall, Queen Elizabeth Hall, Holywell Music Room and the Edinburgh Festival. 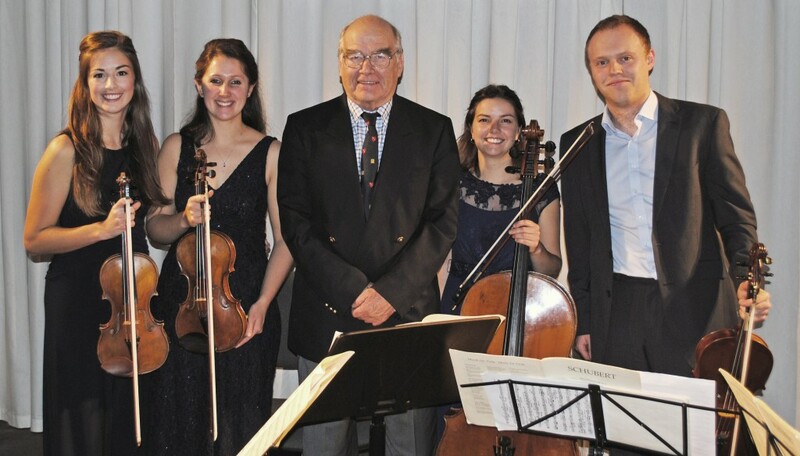 As well as performing the quartet gives coaching to young string quartets at the annual Aberystwyth MusicFest and has led specialist chamber music workshops in North Wales and Gloucestershire. The Solem Quartet have benefited from inspirational teaching from a number of the world’s greatest chamber musicians including Gábor Takács-Nagy, Miguel da Silva, Peter Cropper, Thomas Riebl and Hatto Beyerle. They have attended the European Chamber Music Academy and the National Youth String Quartet Academy as well as courses with the Chilingirian and Maggini Quartets, and in January 2015 they undertook a two-week chamber music residency with Simon Rowland-Jones in Aldeburgh. The quartet were delighted to have been selected for the prestigious Chamber Studio Mentorship 2014/2015, which has allowed them to study intensively with their mentor Christoph Richter at Kings Place.